The Model 9200 and 9300 are new 5-Axis CNC Tool and Cutter Grinders that can manufacture ultra-precise drills, endmills and reamers quickly and precisely with their powerful 21.5 horsepower (16kw) direct drive grinding spindles. These grinders feature Yaskawa AC Drive Amplifiers and Servomotors as well as have Automatic Pick-n-Place Parts Loader/Unloaders available for continuous grinding of parts. 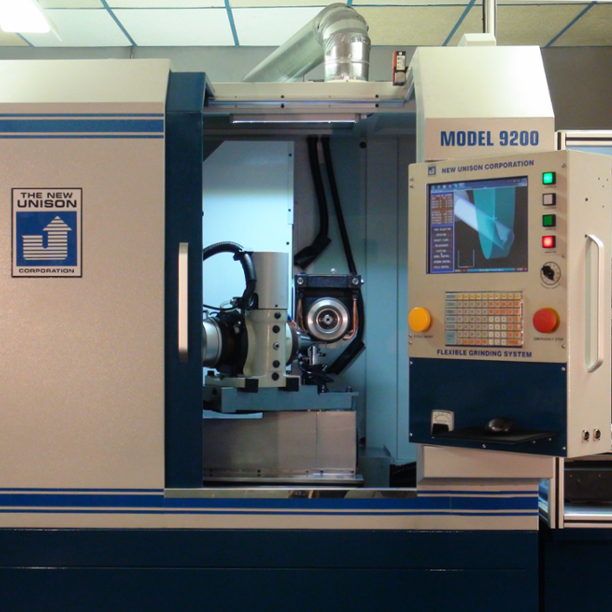 The Models 9200/9300 are equiped with Schaublin Pneumatic Workholding Systems and use precise probe assemblies to guarantee repeatability of parts. Both grinders can be equipped with on-board electric grinding wheel dressing systems. The Model 9200 and 9300 feature Unison's new EZ Software which allows machine operators to quickly customize and/or modify tool geometry with a user friendly interface by merely "filling in blanks" and then verifying the part program by using the machine's real-time 3D Parts Predictor. Unison's software also allows operators to import .DXF files from CAD Software. Each machine is supplied with a complete software package and library of tool programs at no additional charge. The Model 9200/9300s Computer Controls monitor critical machine functions and alert the operator to problems encountered during grinding as well as errors are tracked and logged within the Control to help identify problems. Each grinder can be networked and/or monitored via the internet and can be equipped with a Remote Connect feature allowing direct communication with Unison. Unison Corporation operates from its headquarters in Ferndale, Michigan and is staffed to handle all of your sales, service and/or spare parts needs as well as offers both mechanical and computer control upgrades for all Unison equipment. Our Service Department consists of the same highly skilled technicians who originally built your machinery and is the only factory authorized party who can service Unison equipment. Unison offers its products on a worldwide basis with international sales and support provided in Australia, Italy, Israel, Thailand, Korea, Singapore, Taiwan and Japan. Unison has over 50 years of experience in manufacturing grinding equipment and markets its equipment under the TruFlute and DedTru tradenames with over 10,000 equipment installations serving the medical, dental, aerospace, automotive, off-highway, plastics, and petrochemical industries. 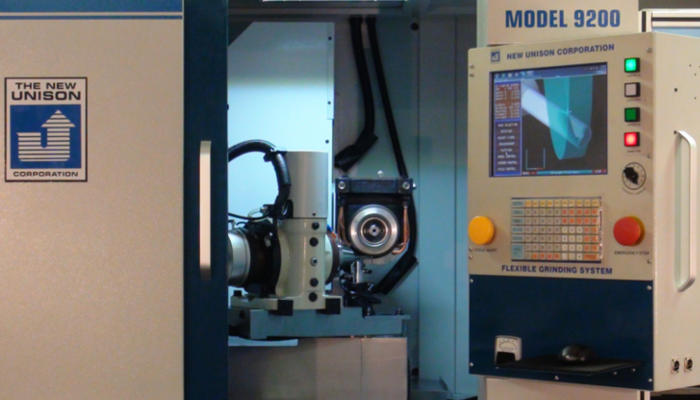 Our CNC product line features the Model 1500 CNC Camless Profile Grinder, the Model 2050 CNC Surface Grinder, the Model 2150 CNC DedTru Centerless Grinding System, the Model 2250 CNC ID Grinder, the Model 2350 CNC TruCut End Gasher, the Model 2450 CNC Roughing Cutter Grinder, the Model 2650 CNC 5-Axis Cutting Tool and Re-Grind/Remanufacture Grinder, the Model 688 CNC Fluter, the Model 4000 CNC Super TruFlute with Hydrostatic Ways, the Model 8350 Combination Cutting Tool/Burr Grinder and the Model 9100 CNC Pulverizer Disk Grinder. Unison also offers manual Models U-12 and U-20 Centerless Grinders as well as our Model 388 DedTru Centerless Grinding System.